It just must be a "scampi" kind of day today (just made a pizza with this!). I'll have to wait a day or two before I indulge again, but I'll be re-creating this soon! Jamie, You had me at PASTA and then to add shrimp. I'm making it and pinning it and sharing it. YUM! Your dish looks very fresh, simple and versatile too! Looks delicious! I know my hubby would love this dish. Thank you for sharing with Foodie Friends Friday. I will be sharing this on my Walking on Sunshine FB page today! Jamie, this look delicious, thanks for sharing and I cant' wait to see what you bring next! 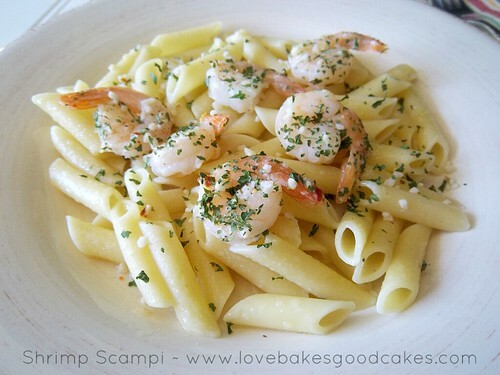 This is great Shrimp Scampi! Hope you have a wonderful week end and thank you so much for sharing with Full Plate Thursday. Yum! Shrimp scampi is one of my favorites. Thanks for sharing at Inspire Us Thursday at Organized 31. Jamie, I love shrimp scampi, can't wait to try out your recipe! Thanks for sharing at Thursday's Treasures, I'm featuring you this week! Oh this looks good Jamie! Love Shrimp Scampi!